After the release of Google’s 2- Step Verification, almost every user has secured his account with this added layer of security. Now when you need to sign in to your account then you require some secret codes apart from your username and password. 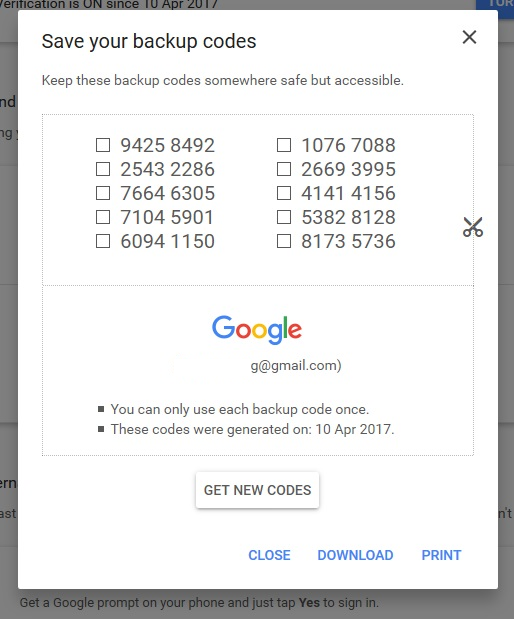 These secret codes are either sent to your registered phone number via message/call or can be generated by your device using Google Authenticator. It means that if somehow any hacker able to get the password for your account, then also he cannot access it as you have 2-Step Verification enabled. But just think for a minute, that you forget to carry your phone along with you, and you need to access your account, then can you sign in to your account. In this situation, the backup codes will help you to sign in to your account. 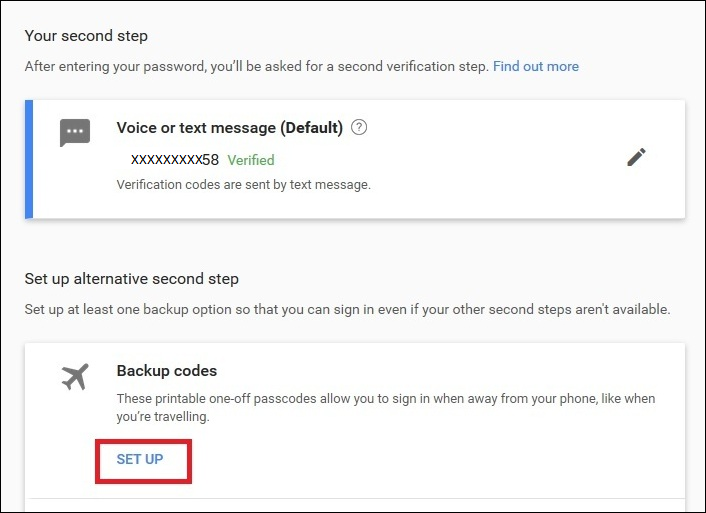 Backup codes are set of numbers which you can generate by logging into your account if you are using 2-step verification. In some unavoidable situations like losing or forgetting your phone, backup codes will provide an alternate way to sign in to your account. Once generated you will receive 10 single-use codes. It means the code once used will automatically become inactive. The process of generating these backup codes is quite simple. You can generate these codes in a fraction of a minute. If you have already activated 2-step verification process then visit the link below, and then sign into your account. A page will open containing the option of Backup codes. Click on Set up to generate the code. Another window will open with 10 single-use codes along with options of Get New Codes, Download and Print. You can either download these codes or print them and keep them at the safe place. Also, note that you can generate a new set of codes anytime you wish. Once you have generated the backup codes, now sign into your account with your username and password. 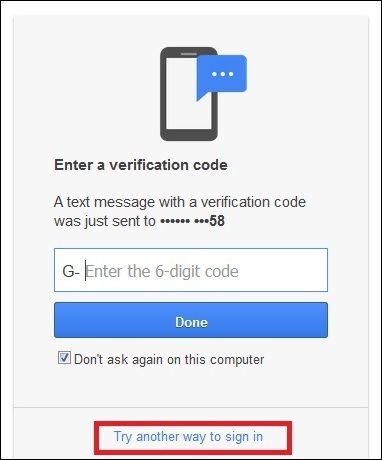 Since you have enabled 2-step verification, a new page will open asking for the verification code which was sent to your registered mobile number. If you do have your phone, then click on Try another way to sign in. In the new window which opens click on Enter one of your 8 digit backup codes. 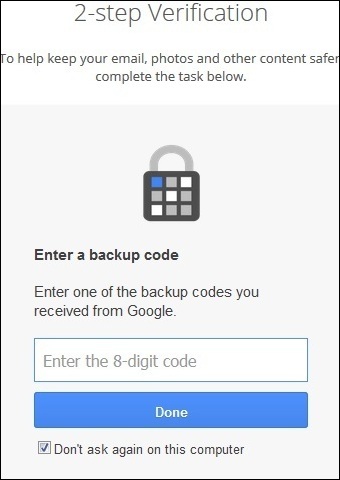 Now enter any one of the backup codes which you have downloaded and click on Done. 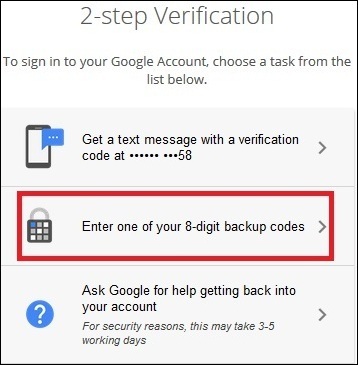 Also read: Lost backup codes for Google 2-step verification, now what? Once provided the correct backup code you can log in to your account. If you are unable to do so, then it means they either you have typed the code incorrectly or you have already used that code before. Please remember that a code once used will automatically get expired, and you cannot use that code in future. We recommend that you keep your backup codes ready, if not already generated, as you never know that when you need them. So ensure to keep your codes safe but accessible.